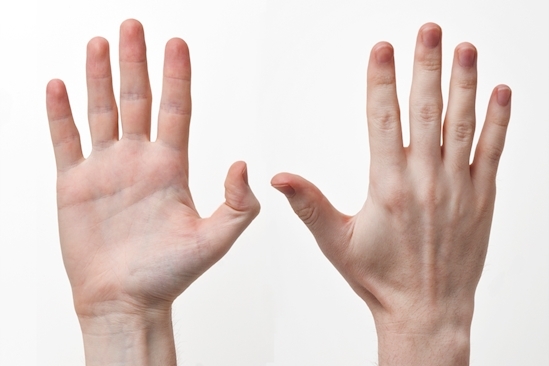 What Your Finger Nails Say About Your Health? There are certain things that reveal a whole awful lot about you and you may not even know it. Certain thing like the texture of your hair, your sleeping patterns, your taste preference, even the color of your eyes. But you know which body part speaks volumes about your health? 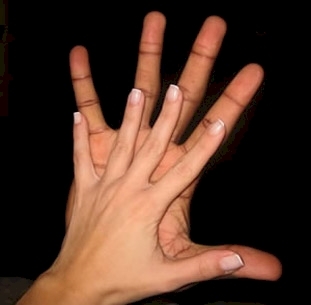 Your finger nails. Honestly! 1. Weak or brittle nails. 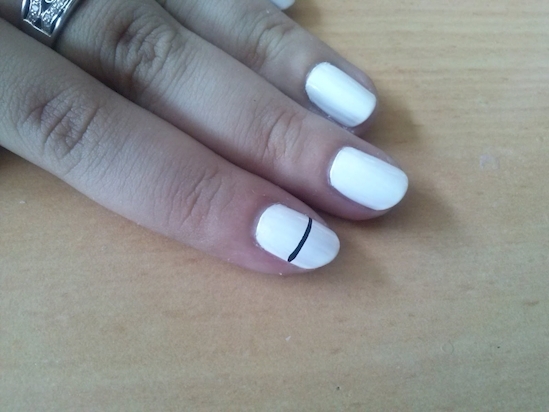 Do your nails bend easily, split often, or crack in several places? 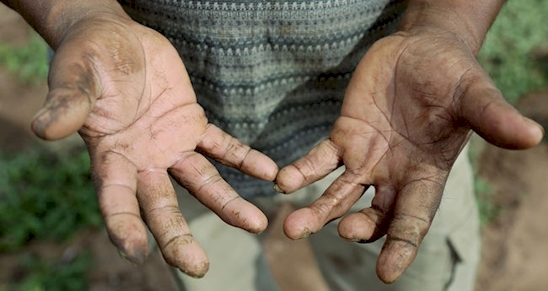 Well, this may be because you’re getting older or it can be related to excessive manicures. As well, it may be due to a deficiency in vitamin A, vitamin C or biotin (a B vitamin that strengthens nails and hair while increasing growth). 2. Pale or oddly colored nails. This is often called Terry’s nail and it’s when the nail bed is white with a rim of dark coloring towards the tip. Unfortunately, this can be a sign of a severe liver disease called cirrhosis. 3. Lines across your nails. 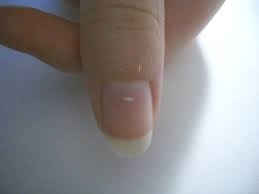 If you frequently notice horizontal lies across your nail beds, that is often an indication of extreme stress. Basically, chill, because that’s some serious stuff there. It’s possible you’ve had white nail beds since birth and it may simply be the way they look. But if this occurs later in life, it could be linked to diabetes mellitus, Hodgkin’s lymphoma, and chronic renal failure. 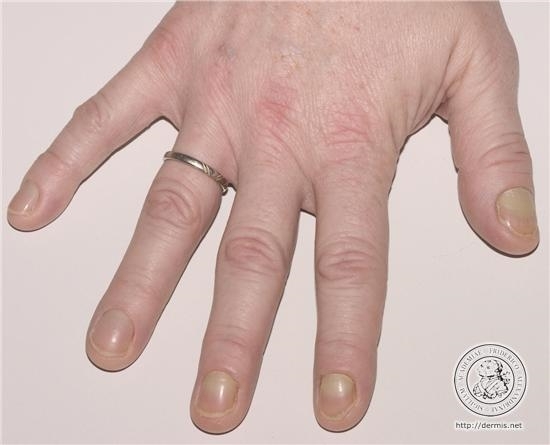 Yellowing nails are often caused by a fungal infection. But, there’s plenty of cases where this was a warning sign for thyroid disease, diabetes, and lung disease. Get your exercise! 6. Dark lines on your nails. This can be an indication of melanoma and that’s bad news. This needs to be detected early for treatment so your best bet is to prevent it from possibly happening early. It’s difficult for sunscreen to penetrate nails so periodically wearing high quality polish (in any color other than clear) will help protect your nails from the sun. 7. 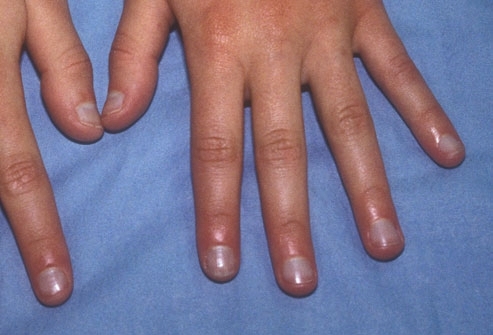 Pain or swelling around your nails. 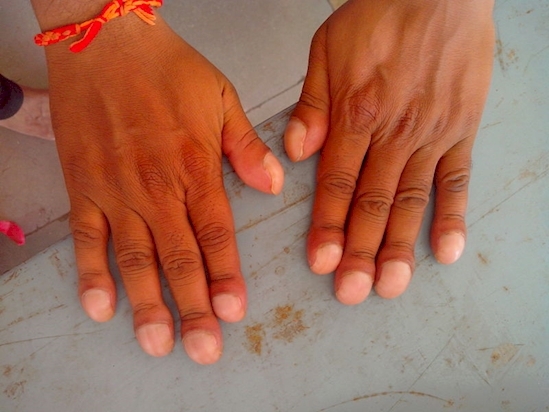 This can be caused from taking poor care of your nails in general or too often manicuring them. As well, it may be the aftermath of a hangnail in which you simply need to make sure it’s clean and not overworked. If it’s only one nail, it will likely clear up on its own, but if it’s many, there’s a chance you have an infection and it will need to be treated. 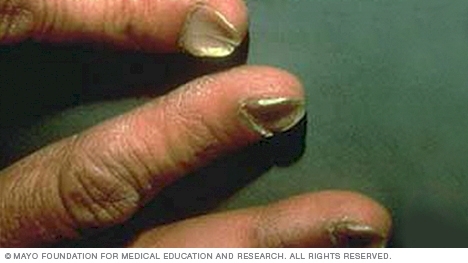 This happens over time and occurs when the nail bed extends to wrap around the finger edges. It’s often associated with low oxygen in the blood and may be a sign of serious lung disease. 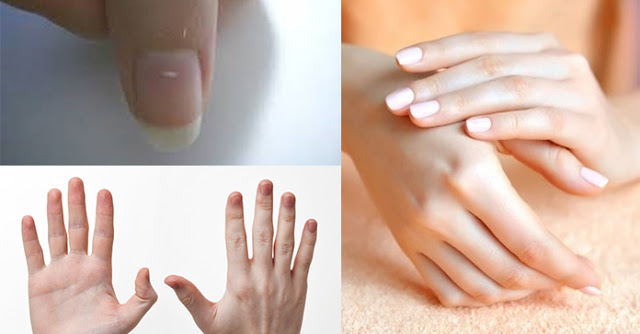 As well, it’s possible that nail clubbing is a result of inflammatory bowel disease, cardiovascular disease, and liver disease. 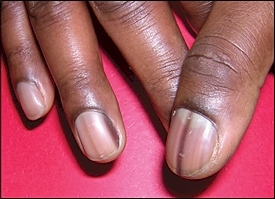 When nails have a bluish tint, it usually means the body isn’t getting enough oxygen. It’s possible this may be caused by a lung problem along the lines of emphysema. 11. White dots on your nails. This is often caused by some kind of trauma from rough work of injury. If you work hard with your hands just try being careful because these dots can be painful and just annoying too…they won’t go away until they grow out. If they persist, it’s possible it’s a fungal infection so get that business check out.